a|e updated to 2.2 - The fluorescence laboratory. The UV-Vis spectral analysis software a|e has been updated to version 2.2. This new version includes a number of bug fixes and improved compatibility with newer versions of MATLAB. To activate the new feature, navigate to the menu Tools->Plot trends. 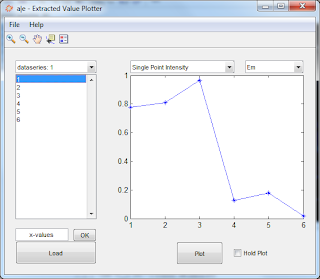 Once activated, the values obtained when integrating multiple selected spectra or from extracting wavelength values using 'Tools->Data extraction', can be plotted in the trend window located at 'Tools->Plot trends->Open trend window'. Note that you are free to customize the program yourself. Daniel used source files from the MATLAB version of a|e to get acquainted with the program structure before writing the new module. Drop me an email if you too are interested in sharing your developments with other users. Go to the download page for more information on bug fixes and new functionalities in a|e 2.2.